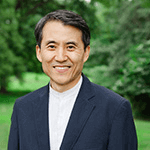 Sim serves as Appointed Associate Professor of Christian Education and Pastoral Ministry in Korean Studies at Midwestern Seminary. He received a Th.D. in Church Growth from Chongshin University and a Ph.D. in Philosophy of Education from Korea University. He has completed post-doctoral studies at Hebrew University in Jerusalem on a full scholarship provided by the National Research Foundation of Korea. Sim also earned an M.Div. from Korea Baptist Theological Seminary and an M.Ed. from Yonsei University. He graduated from Seoul National University of Education. Sim brings his expertise both in academics and church ministry to Midwestern. He has been serving as a key pastor in various critical positions with the world famous Global Mission Church in Korea for about 20 years while simultaneously teaching in many universities and seminaries. His research interests include spiritual growth, Christian culture, and the community spirit of early church, among many others. His wife, Hong, has served as an elementary school teacher for 20 years. Sim and his wife have one son, Sangyoon. “The Strategy for The Church Leadership Transmission.” The Gospel and Practice, Vol. 21 (Apr. 2010). — Seoul: Korean Society of Evangelical Practical Theology, 2010, pp. 246-283. “The Evangelical and Pastoral Paradigm Which We Should Recover in The Culture Age” The Gospel and Practice, Vol. 20 (Oct. 2009). — Seoul: Korean Society of Evangelical Practical Theology, 2009, pp. 58-88. “A Study on Educational Model for Education of Korean National Identity in A New Paradigm – Education of National Identity of Jews Centered” The Journal of Research in Education, Vol. 35 (Nov. 2009). — Seoul: Korea Univ. Institute of Educational Research, 2009, pp. 63-94. “A Study on the Direction and Strategy of Church Transformation” Reformed Church Growth Studies, Vol. 1 (Feb. 2007). — Seoul: The Society of Reformed Church Growth Studies, 2007, pp. 183-212. “A Study on Theory of Existential Teacher in Kierkegaard” The Journal of Research in Education, Vol. 24 (Mar. 2006). — Seoul: Korea Univ. Institute of Educational Research, 2006, pp. 1-24. “Post-modern Popular Culture and The Task of The Christian Education” The Journal of Collage and Evangelism, Vol. 9 (May. 2004). — Seoul: The College Evangelization Association of Korea, 2004, pp. 131-157.